Experience the beauty of the Bay State at 'Seaport Village,' a 2-bedroom, 1.5-bathroom vacation rental cottage on Cape Cod. Located 1 mile from the beach in South Yarmouth, this recently renovated home for 6 is perfect for those looking for pristine beaches and family fun. Whether you were drawn to the area by the great seafood restaurants, beautiful scenery, or top-notch family attractions, you're sure to enjoy the well-deserved R&R you get inside this elegant family home. When you need a break from sand and surf, retreat to the cottage's spacious living room and melt into the couch. 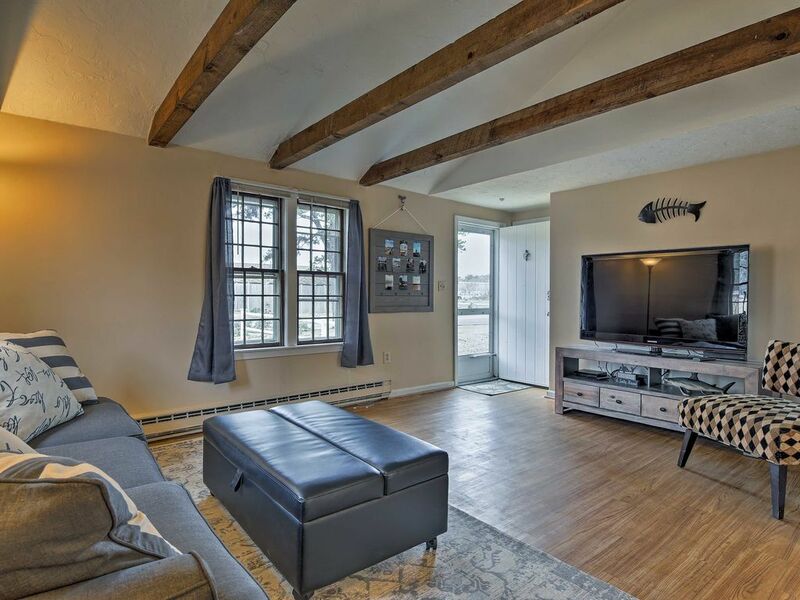 As you stream your Netflix favorites on the flat-screen Smart TV, you'll feel completely at peace under the exposed beam ceilings. Work up an appetite at Cape Cod Inflatable Park? Head into the fully equipped kitchen and whip up something delicious. No matter what you choose to prepare with the state-of-the-art appliances, your friends are sure to be impressed as they take their first bites at the dining table for 6. All of the home's bedrooms feature top-of-the-line furniture, flat-screen cable TVs, and DVD players, making them great places to drift to sleep. Once your kids have woken up in their plush twin beds, grab their bathing suits from the in-unit laundry machines and head out for another day of oceanside excitement. Located just 1 mile from Seaview Beach, this cottage offers endless opportunities to swim, sunbathe, and make unforgettable family memories. If you're traveling with kids be sure to check out the Cape Cod Inflatable Park. Situated less than 2 miles from the property, this park offers inflatable rides, an arcade, trapeze, and more! There are also batting cages, a driving range, go-kart track, bowling alley, and more sitting just minutes from the cottage. Experience the exciting world of pirates when you visit the Whydah Pirate Museum. The Whydah was a slave ship that was commondered by pirates and eventually sunk in the waters of Cape Cod. The museum features artifacts, maps, and pirate treasure that will give you an insight into life at the time. When you don't feel like cooking, eat like a local at one of South Yarmouth's many top-notch restaurants. In addition to trying feasting on delicious food at eateries like Gerardi's Cafe and Jerk Cafe, an order of clam chowder at Captain Parker's is a must. Had no basic amenities. Bed was good and place was clean not close to beach at all. My wife and I visited the Cape for Columbus Day Weekend. We stayed Friday night through Sunday morning. The house was extra clean and within a short walk to the beach. Wish we had more time to explore. Could easily fit 6 people in the house. Parking was a bit unclear, as we arrived after dark, and I wish they left instructions for the HVAC, other than that, the stay was just what we were looking for. Great location. Close to everything! The house is quaint, neat, clean, modern and overall perfect for a small group. Very cute cottage! Plenty of room for our family of four. Close to shopping and the beach.